Ada pertanyaan untuk Railay Princess Resort & Spa? Terletak di area Railay yang menyenangkan, Railay Princess Resort & Spa memiliki posisi yang sangat bagus di pusat pantai, olahraga, romansa di Krabi. Hotel ini tidak terlalu jauh dari pusat kota, hanya 15 km dari sini dan umumnya hanya membutuhkan waktu 45 menit untuk mencapai bandara. Sebagai sebuah tempat untuk beristirahat dan bersantai, hotel ini terletak hanya beberapa langkah dari berbagai obyek wisata kota ini seperti Real Rocks Climbing School & Shop, Pantai Railay, Pantai Phra Nang. Dengan menawarkan pelayanan superior dan sejumlah fasilitas kepada para tamu hotel, Railay Princess Resort & Spa berkomitmen untuk memastikan penginapan Anda senyaman mungkin. Sejumlah pilihan fasilitas kelas atas seperti WiFi gratis di semua kamar, resepsionis 24 jam, Wi-fi di tempat umum, layanan kamar, antar-jemput bandara dapat dinikmati di hotel ini. Masuki salah satu dari 126 kamar yang menggoda ini dan lepaskan rasa penat Anda dengan sejumlah fasilitas yang tersedia seperti televisi layar datar, akses internet - WiFi, akses internet WiFi (gratis), kamar bebas asap rokok, AC. Daftar lengkap fasilitas rekreasi tersedia di hotel termasuk pusat kebugaran, kolam renang luar ruangan, spa, pijat, klub anak-anak. 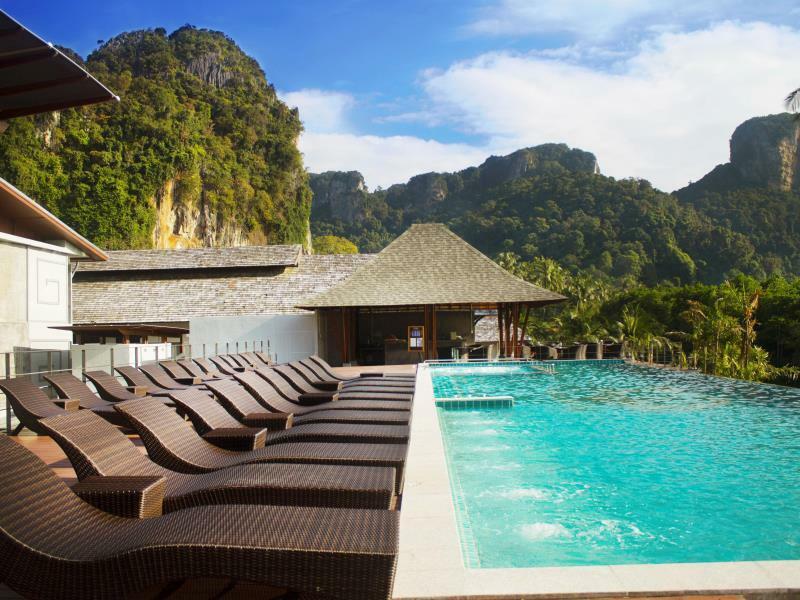 Railay Princess Resort & Spa adalah pilihan yang cerdas bagi para wisatawan yang berada di Krabi dan menawarkan pengalaman menginap yang menenangkan setiap saat. Antar-jemput bandara tersedia dengan biaya tambahan. Untuk memesan layanan antar-jemput, silakan informasikan detail kedatangan Anda kepada properti sebelum kedatangan. Properti ini hanya dapat dicapai dengan perahu. Perahu taksi tersedia di Dermaga Ao Nam Mao. Sebagai alternatif, tamu bisa naik perahu taksi dari Dermaga Ao-nang ke Pantai Railay. Nama tamu pada konfirmasi pesanan harus sama dengan nama pemegang kartu kredit. Nama yang tertera pada kartu kredit yang digunakan untuk check-in harus sama dengan nama tamu pada reservasi. Properti akan menagihkan pembayaran baru jika tamu tidak bisa menunjukkan kartu kredit saat check-in. Pantai yang tersedia di properti adalah pantai umum yang mungkin sangat ramai selama hari libur dan musim liburan. Mohon jangan letakkan payung dan kursi berjemur di pantai. Fasilitas ini hanya boleh digunakan di kolam renang properti. Properti menyediakan layanan transfer bandara dengan biaya tambahan sebesar THB 1.200 untuk pukul 06:00 sampai 18:00, dan THB 1.500 untuk pukul 18:01 hingga 05:59. Untuk memesan layanan transfer, silakan informasikan detail kedatangan Anda kepada properti sebelum kedatangan. Tamu hanya bisa mengakses properti dengan perahu. Dari Bandara Krabi, tamu harus naik taksi ke Dermaga Ao Nam Mao atau Pantai Aonang untuk naik perahu ke Pantai Railay. Membutuhkan waktu 15-20 menit untuk sampai di Pantai Railay. • THB 1.500 sekali jalan, maksimum untuk 6 orang per perahu (hanya dari pukul 16:01 sampai 07:00) dari Dermaga Ao Nammao (Kantor Railay Bay) menuju Resort, atau dari Resort menuju Dermaga Ao Nammao. Was a pretty nice resort, two nice pools and the breakfast buffet was spot on. Staff really nice and helpful , my only complaint was our bathroom had some stains on the floor when we arrived and noticed some hairs in there. These little things make the difference between 3-4 stars and 5 stars, the details. Great location 7 min walk to the beach and right by all of the restaurants on walking street. we were unlucky because we had a very noisy room near a ventilation. The view from the terrace of our room overlooked a courtyard with plants. The room is very sober, not really decorative. The breakfast was very nice because the sea view was nice (but no beach on this east side of Railay). Longboats seem more expensive in the East than in the West. There are 2 pools with a nice view. Railay is a beautiful place, but crowded. At Railay Princess you will find a very helpfull and nice staff, they will do their best to help you with any question or need. When we had a problem, they did their best to solve it. The hotel is quite big and because of that not so personal and cosy as I prefer, but I think they can satisfy most people. At RP we experienced the best beds of our trip to Thailand. We stayed for two nights. Staff was great, friendly and spoke great English. Hotel has lovely facilities. Breakfast had everything we needed to start our days. Hotel was also right off the Railay east pier when you first get there, which was really nice. Just a short walk to Railay West beach and the main village. But also awesomely located to the Railay East walkway to find better deals for food, massages and drinks! Overall, better than I expected. Nice location, just at the pier. 3 mins walk to Railay West Beach, 5 mins walk to night market street. The Staff is really friendly and helpful. We lived in garden view room, the room is big and clean, the view is really nice. However the safybox doesn't work, the bathroom is very hot because of ventilation. The swimming pool water is not that limpid. There are so many flies when we eating breakfast. But anyway we recommend this hotel! My 11 yo son and I love that resort a lot! It has two pools with beautiful view. Stuff were very nice and friendly. Good breakfast. Short walk to the beach. I used their gym-it was good! Do not take a deal on Agoda for a taxi services-rip off!! Staffs are friendly and helpful, breakfast buffet was really good. Its children friendly and accessible to both beach side, room we got was big to fit in all of us including 2 small kids. Will stay here again next time. The resort was the most conveniently located when getting off at the Railay East boat peer. We walked right off the boat and to our resort. Didn't have to unload into the water like you do at Railay West. The restaurant was a bit pricey compared to what's out on the strip, but we ate there twice because it's convenient and had many options. The free breakfast buffet each morning was great. They had fruit, various breads and pastries, an omelet station, salad bar, juice bar, french toast, pancakes, rice, and about 4 options that were dinner-like (for example- pasta). The room was clean and spacious. The water pressure in the bathroom shower was set too low for our liking. The pools were gorgeous and never crowded. They also have room service and pool side service. It's a short walk to the nice beaches on Railay West and the shops, restaurants, bars, and massage parlors. We were there to rock climbing for the week and our resort was conveniently located between several climbing areas. The first room I was given overlooked a building site which made me uncomfortable as a solo traveller as the men stared at me when I was on the balcony. Apparently I had this room as I booked on promotion. The next day I was moved to another room and the air conditioning broke at 11pm. At 1am I was moved to a deluxe room after refusing to go back to the building site room. The next day the manager said the air conditioning should only be set at 25 degrees as they are on an island which is nonsense as I had it at 18 degrees on Koh Lipe which is super remote. He agreed to let me stay in the deluxe room for my last two nights. Effectively, I lost two days of my holiday from moving about and mislaid possessions as it was all such a rush. Overall - The hotel is very tired and dated - The towels were not clean which is ironic given they tell you not to make the towels dirty or they will charge you - The showers are poor - The whole resort smells of sewage - The pools have no shade and some broken sun beds - The breakfast was ok - The staff don’t smile and are abrupt Railay gets away with fairly terrible hotels at a premium price. The restaurants are also pretty bad. I would recommend staying in Ao Nang and travelling across to visit. The climbing is awesome and so are the sunsets but that’s about all this over priced ‘island’ has going for it I’m afraid. The 'island' itself is fairly small so Amy location is great but this place is extra special because it is literally right in front of the east beach pier (the only pier) where the long tail boats come in so you do not have to wade through water. Rooms are spacious and staff are super friendly and accommodating. Good breakfast spread. Two beautiful swimming pools and nice green grounds. Highly recommended. We initially booked Superior room thinking it was decent based on photos. However on arrival, we realised the room didn’t have a light (that’s right!) - only light is from the bathroom! Also the bathroom is old and dated with no fan or ventilation. So we upgraded to Deluxe which was much better - modern room and bathroom. So just beware of the Superior rooms. Location was good. Around 10mins walk to Railay West and 15 mins to Phrang Nga beach. Staff friendly and helpful. Good breakfast. Pools looked good but we didn’t use them. This is not a beachfront property because there is no beach in front of it, it's just the pier. The pool is nice with a nice sunrise view. The breakfast is very good, many options. Spa was closed unfortunately and there was no mention about this anywhere. The room was big, clean and comfy. I loved my stay at the Railay Princess. It’s on the east side of Railay so it’s not beachfront, but Railay is so small that in my opinion, it doesn’t matter. When you arrive by ferry it’s the first hotel you come to, which is very convenient when schlepping around your bags. The rooms are very comfortable, the infinity pool is great, and I looked forward to breakfast every morning! Highly recommend, especially for the value. Perfect location and right next to the pier! Everything was perfect, except the Wifi was terrible in the back area where we were staying. Not a big problem for us but when we did want access we had to go to the front area. The pools were amazing and the staff were really lovely! Central location to all beaches and night life. After 3 nights at the hotel we wanted to stay at Railey one more night and they sort of changed their opinion every hour if they have available rooms or not. Then we decided to move out and moved to a neighbor hotel Bhu Nga Thani Resort. This eventually was the best hotel we stayed in Thailand till now. We got a nice room in a high floor with a stunning view and we really enjoyed our last night in Railey there, too bad we didn't move there earlier. It's a bit more expensive but it was worth it!!! Pros. Quieter than on the west beach . Both beaches easy walking distance. Good choice of restaurants and bars nearby . Cons. one block backs onto vent of next door hotel vent so is noisey outside room but once inside with aircon on can't hear it. i spent 2 nights in a superior room and 11 nights in deluxe. the superior was great but the deluxe was amazing. definitely worth the extra. the pool on the second floor is fabulous. the other pool looked good too but didn’t lure me over. the location is perfect imo because it’s close to phra nang beach which is the best in the area. west beach is too busy with resorts, shops, restaurants & boats. east beach is not for swimming. this railay princess is close to cheaper priced dining ... and better quality dining imo. don’t eat at the hotel though. while room & resort cleanliness is good, the restaurant isn’t as clean. i am allergic to oysters and got sick from the prawns on the forced $124 meal on nye because they don’t separate seafood well enough. i also got food poisoning from breakfast (eggs, rice & fruit) one day. can’t blaim any of it on alcohol because i didn’t have any. i would absolutely recommend princess to anyone but caution them about dining there. lots of other options. Loved my stay at the Railay Princess. My deluxe room was beautifully appointed and worth the extra cost. Breakfast was great, staff were lovely, I really enjoyed the tranquility and sea breeze at the roof top pool. Location was great for access to West Beach via the walking street. Would definitely recommend.